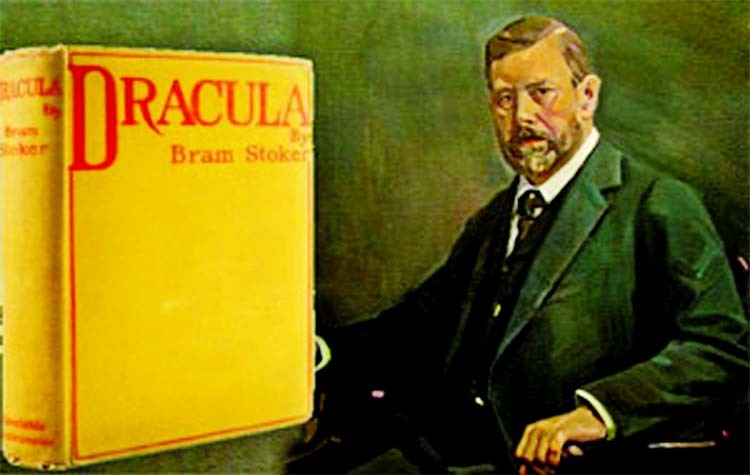 Irish writer Bram Stoker (1847-1912 is best known for authoring the classic 19th century horror novel Dracula. Born in Ireland in 1847, Bram Stoker studied Mathematics at Dublin's Trinity College and embarked on his longtime role as an Assistant to Actor Sir Henry Irving in the 1870s. He also began carving out a second career as a writer, publishing his first novel, The Primrose Path, in 1875. Stoker published his most famous work, Dracula, in 1897, though he died before the fictional vampire would achieve widespread popularity though numerous film and literary adaptations in the 20th century. In 1864, Stoker enrolled at the University of Dublin-founded by Queen Elizabeth I in 1592-and attended the Universityâ€™s sole constituency, Trinity College. He studied Mathematics at Trinity, graduating with honors in 1870. Stoker then began working as a civil servant at Dublin Castle, home to British royals in Ireland from the early 1800s to the early 1920s. (Stokerâ€™s father had also served as a civil servant at the castle, and helped his son land a position there.) During this period, Stoker began juggling another role: In the evenings, he worked as an unpaid writer for a local newspaper, the Dublin Evening Mail (later the Evening Mail), penning reviews of various theatrical productions. Stoker also found time for his short stories, publishing The Crystal Cup in 1872. In the late 1870s, Irving offered Stoker a Management position at his production company/venue in England, the famous Lyceum Theatre in Londonâ€™s West End. His duties as Manager included writing letters-sometimes up to 50 per day-for Irving, as well as traveling worldwide on Irvingâ€™s tours. During this time Stoker married an aspiring actress named Florence Balcombe, who gave birth to their son, Irving Noel Thornley, in late 1879. In 1875, Stoker published what became his first novel, The Primrose Path. He continued to publish writings while managing the successful Lyceum Theatre, including the short story collection Under the Sunset (1882) and his second novel, The Snakeâ€™s Pass (1890), earning modest acclaim. More notably, he garnered public praise for his many roles dedicated to the arts. In 1897, Stoker published his masterpiece, Dracula. While the book garnered critical success after its release, it didnâ€™t achieve peak popularity until well after its authorâ€™s death. After Dracula, Stoker continued to churn out an array of fiction and nonfiction works. He wrote a total of 12 novels, his later efforts including Miss Betty (1898), The Mystery of the Sea (1902), The Jewel of Seven Stars (1904) and The Lair of the White Worm (1911), which was later published under the title The Garden of Evil. Stoker served as Lyceumâ€™s Manager for nearly 30 years, until Irvingâ€™s death in 1905. He suffered a stroke shortly afterward, and spent much of his final years battling through poor health and shaky financial footing. Stoker died in London, England, on April 20, 1912, with various reports citing the cause as complications from a stroke, exhaustion. Stokerâ€™s legacy has endured through his most famous work, Dracula, which has inspired the creation of numerous theatrical, literary and film adaptations. Among them are the 1931 film Dracula, starring actor Bela Lugosi, and FW Murnauâ€™s 1922 feature Nosferatu, starring Max Schreck, two early screen successes that propelled the vampire myth to the forefront of popular culture. In 2009, the authorâ€™s great-grand nephew, Dacre Stoker, made his entry into the field with the publication of Dracula: The Un-Dead, with collaborator Ian Holt. The two said they had based their book on Bram Stokerâ€™s handwritten notes and excised plot threads, even including the character of Bram Stoker in their story as a nod to the original source.